This continuing education course presents competency-based objectives for fitness instructors and personal trainers to be able to lead safe and effective activity programs for older adults with diverse abilities. The skill of teaching movement and exercise to older adults is often overlooked in training programs. Physical Activity Instruction of Older Adults Print CE Course details the fundamental knowledge and skills outlined in the International Curriculum Guidelines for Preparing Activity Instructors of Older Adults developed by an international coalition of senior fitness specialists. The text presents competency-based objectives for fitness instructors and personal trainers to be able to lead safe activity programs for older adults with diverse abilities. Physical Activity Instruction of Older Adults Print CE Course will help you understand various predictors of successful aging and explain the benefits of physical activity for body, mind, and spirit. The course identifies and dispels some of the common myths about physical activity and aging and discusses initiatives to promote more physical activity among older adults. Coverage of risk factors that determine the health, physical activity, and disability status of older adult participants helps you design safe, effective programs. You will also be able to incorporate simple mind–body exercises into a well-rounded exercise program. At the conclusion of the course, you will take a continuing education exam for credit through participating organizations. Describe the general demographics of aging throughout the world and explain the differences among chronological, biological, and functional aging. Understand the general benefits of physical activity for promoting health and reducing disease and disability. Understand the rationale for the development of the subdiscipline of kinesiology called gerokinesiology. Understand various predictors of successful aging and explain the benefits of physical activity for body, mind, and spirit. Discuss how physical activity affects older adults’ quality of life, and describe the social benefits associated with physical activity for older adults. Discuss national initiatives to restructure society in order to promote more physical activity among older adults. Explain how physiological declines in various body systems affect functional mobility and independence, and identify types of regular physical activity that can help counteract these performance-limiting changes. Select, administer, and interpret the results of screening tools to determine the health, physical activity, and disability status of older adult participants. Recognize the signs and symptoms of diseases that place an individual at risk during physical testing and exercise. Describe the purpose and benefits of conducting field-based assessments, and select assessment tools that measure physical impairments and functional limitations of older adults. Locate resources that describe how to administer and interpret field-based assessment instruments. Administer and interpret results of selected tests of cardiorespiratory function, muscle strength, and balance and provide meaningful feedback to clients about laboratory test results. Develop an individualized behavior modification plan that includes key cognitive and behavior change strategies. Assist older clients in developing short- and long-term goals, monitoring progress, and modifying goals as needed. 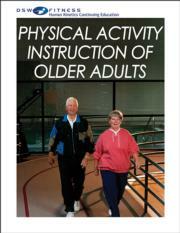 Apply exercise principles when developing physical activity programs for older adults. Develop appropriate activities for the warm-up and cool-down components of an exercise class for older adults. Describe the age-associated changes in joint and muscle flexibility and the benefits of flexibility training for daily function. Incorporate flexibility training into a physical activity program for older adults. Describe the effectiveness and safety of resistance training and design safe resistance training programs for older adults. Describe the physiological and psychological benefits of aerobic endurance training. Design and adapt aerobic endurance training activities in individual and group settings. Describe how age-associated changes in multiple body systems affect balance and mobility, and identify the essential skills for good balance and mobility. Incorporate simple mind–body exercises into a well-rounded exercise program. Define and develop a sport-specific training program for a master athlete. Describe specific behavioral changes that are typically associated with the learning of new motor skills. Incorporate techniques to add fun to group exercise, and use promotional strategies to market your exercise program. Modify exercises to enhance safe participation and reduce injury among older adults with specific medical conditions. Understand how to develop a risk management plan to promote a safe exercise environment and respond to emergency situations. Understand and comply with ethical guidelines for personal trainers and group instructors. A continuing education course for those designing or implementing physical activity programs with older adults, including fitness specialists, athletic trainers, physical therapists, personal trainers, activity directors, activity assistants, and therapeutic recreation specialists. C. Jessie Jones, PhD, is a professor in the division of kinesiology and health promotion, director of the Lifespan Wellness Clinic, codirector of the Center for Successful Aging, and past director of gerontology programs at California State University at Fullerton (CSUF) and University of New Orleans. She has an extensive background in gerontology, health, and exercise science. Professor Jones is nationally and internationally known in the field of exercise science and aging for her research, program design, and curriculum development. She has received several research grants exceeding $1 million, and her work has been published in numerous professional journals and cited in more than 100 popular newspapers and magazines. Dr. Jones has conducted over 100 professional presentations at conferences across the United States and abroad. She has coauthored two books and videos on senior fitness assessment and programming, has coauthored a balance and mobility training manual and video, and is editing a textbook to prepare senior fitness specialists. In addition to her extensive research agenda, Dr. Jones has received awards for her research, teaching, and community service, including the Distinguished Faculty Award for the College of Human Development and Community Service. Dr. Jones is currently investigating the long-term effectiveness of a community-based balance and mobility training program in 18 senior centers. Debra J. Rose, PhD, is a professor in the division of kinesiology and health science and codirector of the Center for Successful Aging at California State University at Fullerton. She is also a professor in the physical therapy department at Chapman University in Orange, California. Her primary research focus is on the enhancement of mobility and the prevention of falls in later years. Dr. Rose is nationally and internationally recognized for her work in fall risk reduction assessment and programming. Her research in fall risk reduction in the elderly has been published in numerous peer-reviewed publication, including the Journal of the American Geriatric Society, Archives of Physical Medicine and Rehabilitation, Neurology Report, and the Journal of Aging and Physical Activity. The innovative fall risk reduction program she developed was recognized by the National Council on Aging as one of seven meritorious programs nationwide that promotes a healthy, active lifestyle. Dr. Rose’s entire program was published in her book FallProof! A Comprehensive Balance and Mobility Training Program. She is a fellow of the American Academy of Kinesiology and Physical Education, former executive board member of the North American Society for the Psychology of Sport and Physical Activity, and co-editor in chief of the Journal of Aging and Physical Activity. The innovative fall risk reduction program she developed called FallProof was recognized by the Health Promotion Institute of the National Council on Aging in 2006 as a best practice program in health promotion. The program was published by Human Kinetics and is titled FallProof! A Comprehensive Balance and Mobility Training Program. This program is currently being implemented in numerous community-based settings and retirement communities throughout the United States. She also currently serves as a member of the national steering committee developed by the National Council oon Aging to guide the implementation of the FallsFree initiative aimed at preventing falls among older Americans. Debra is also the co-editor (with C. Jessie Jones) of a book titled Physical Activity Instruction of Older Adults that was published by Human Kinetics in 2005. This textbook serves as the foundational text for the recently published International Training Guidelines for the Preparation of Physical Activity Instructors of Older Adults. She is a fellow of the Research Consortium of AAPHERD and the American Academy of Kinesiology and Physical Education.